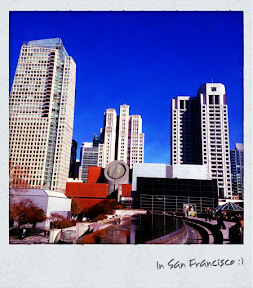 For a couple of days, I'm up at the city by the bay. Today I walked three billion miles. No exaggeration. My feet are tingling and my knee hurts like hell. Where is the Advil damnit. I'm not sure why homeless people enjoy talking to me. Maybe it's because I stop and listen when they call out. Even though I don't give them money, they wish me a good day and sometimes I get a "God bless" which is really funny coming from them. I saw a homeless person dragging a suitcase. I thought that was much more tasteful than a shopping cart. And it's probably easier to organize all that homeless stuff. How did I know she was homeless? No one that dirty is gonna be taking a trip. And even if she had a ticket, there would be no way that Southwest Airlines would let her on a plane. I made it to the Haight-Ashbury district. This place has really seen its day. Tourists and wasted looking poseurs with dreds. Get a freakin' job. The hippie life didn't work. And no, I don't want a bud. 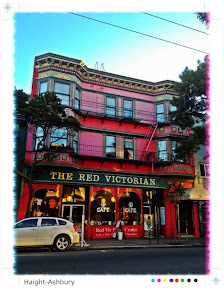 I did like the Red Victorian though. The universal center of peace love and happiness. Maybe one day I'll stay there and listen to "me and Bobby McGee". Freedom is just another word for nothing left to lose. Overall I like San Francisco. I don't like the fact that the museum of modern art is closed on wednesdays but that's because I tried to go there on a Wednesday. The gift shop was open. You can browse books and buy artistic egg holders. And I learned about Banksy.